Polish Amor ♥: Let's Get Funky! Twinsie Friday is here, oh yes the week goes by super quick!!!! 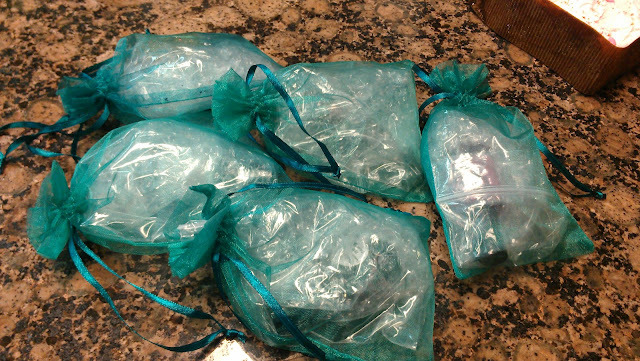 What is that awesome glitter you may ask???? 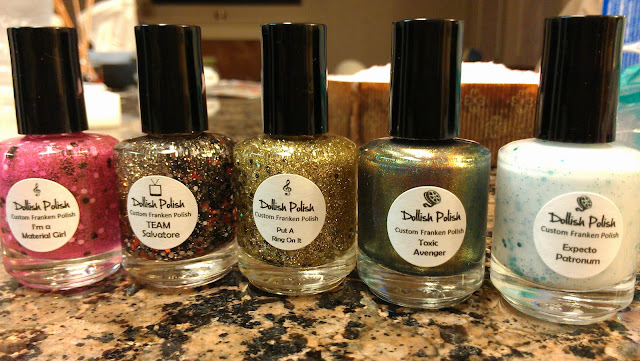 Well it is TEAM Salvatore which I recently purchased from the lovely and talented Dolly at Dollish Polish Etsy Shop, she makes so many wonderful frankens, I WANT THEM ALL!!!! TEAM Salvatore is inspired by the Vampire Diaries, is a mixture of large red and black square glitter with smaller black & silver hex and tiny silver glitter. At first I had a hard time picking up the big pieces, but after I messed with it for a bit I got the hang of it. I noticed that if you swirl the brush around for a bit you get a lot of the glitter :) When I was done with my mani I felt it looked very vampirish LOL so it went well with the polish theme. Dude! Your funky is awesome! I really appreciate the shout out! But I don't own the rights I got it from Chloe's nails! I just went crazy and every mani has a funky cause I love that look! I love that Perceval. So glad you love it too! 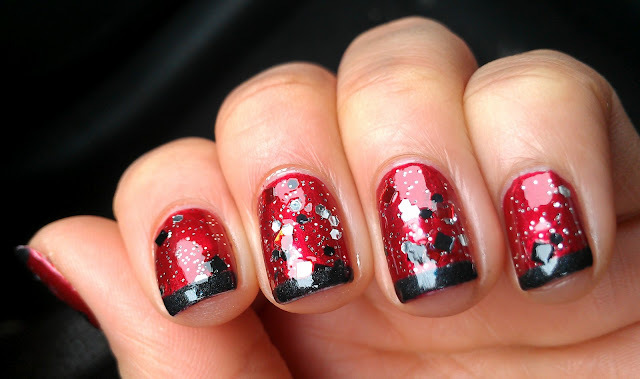 I just love red and black together! Love you too BFF! LOL i know you don't but in my eyes you do :-P and thanks for sharing the love with Perceval.. it is awesome! yeah that glitter is really awesome! This is gorgeous, your so creative, I always think of fingers too when I see funky french, love those dolish polishes. Looks great: Love your new goodies! Toxic Avenger reminds me of Space Cadet. wow i love this!! its so cool! These are so cute. 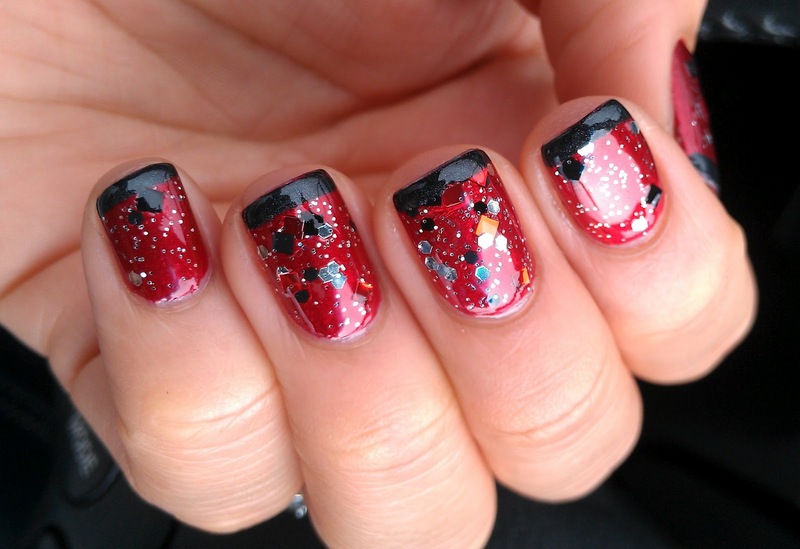 They remind me of ladybugs! don't hate bish, ewwwww I don't want nails matching your chones... next thing I know you have a picture of them on your blog ewwwwww.... I'll pick stamping next week... see how you handle that! umm excuse me hoe! but my chonis are cute enough to be up in my blog, as a matter of fact should i send you a pic of the ones im wearing tonight?! hahahhaa!! and no ! i dont do stamping ! Your posts/nails are always so good! Thats my kind of french mani. 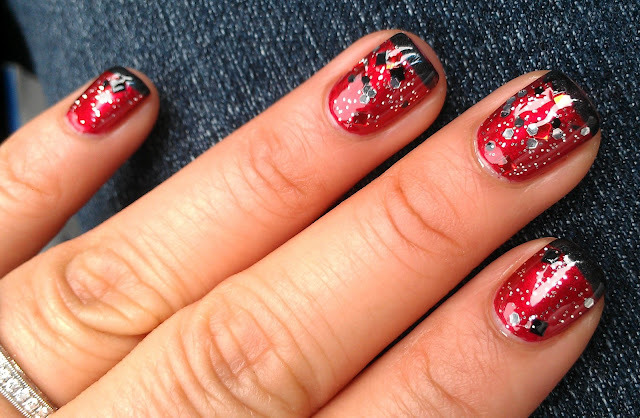 Red and black, how can you go wrong when you throw in glitter?! Love it, I may steal this look! Can't wait to see you wear those new polishes!!! Lovin' the funky french - looks edgy!! Love the funky french tips :D And great franken colors! I'm intrigued by Toxic Avenger! 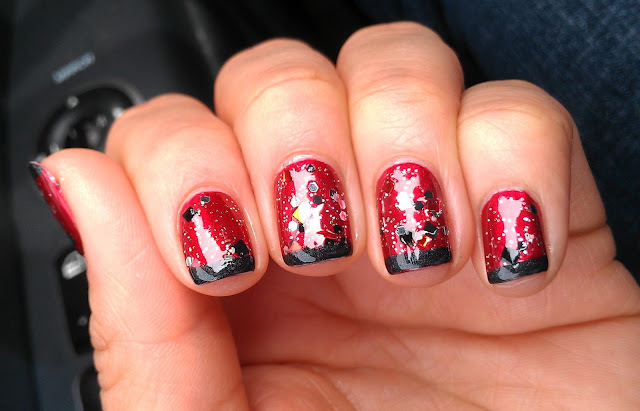 A Vampire Diaries-themed polish... I need it! =P This look makes me think Casino Night or Poker Night, I love it!